Owen Chamberlain was a Nobel laureate in physics and co-discoverer of the antiproton. His institutional affiliations included University of California at Berkeley, the Manhattan Project, and the University of Chicago. July 10, 1920Birth, San Francisco (Calif.). 1941Obtained AB, Dartmouth College, Hanover (N.H.). 1942 – 1943Physicist, Berkeley Radiation Laboratory, Manhattan Project, Berkeley (Calif.). 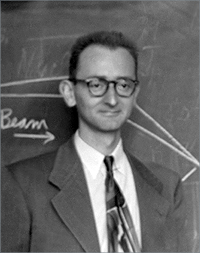 1943 – 1946Physicist, Los Alamos Laboratory, Manhattan Project, Los Alamos (N.M.). 1948 – 2006Instructor to Associate Professor of Physics (1948-1958); Professor of Physics (1958-1989); and Emeritus Professor of Physics (1989-2006), University of California, Berkeley, Berkeley (Calif.). 1949Obtained PhD in Physics, University of Chicago, Chicago (Ill.). 1959Awarded Nobel Prize in Physics with Emilio Segrè "for their discovery of the antiproton". 1960Member, National Academy of Sciences. February 26, 2006Death, Berkeley (Calif.). Ph.D. advisor at University of Chicago, "Diffraction of slow neutrons in liquids." Advised by Chamberlain at University of California, Berkeley, "A search for fractionally charged particles in ee± annihilations." Research advisor at University of California, Berkeley; shared the 1959 Nobel Prize in Physics "for their discovery of the antiproton;" and both employed at University of California, Berkeley. Advised by Chamberlain at University of California, Berkeley, ""Inclusive distributions and two particle correlations in ee± annihilation at 29 GeV center-of-mass energy." Physicist, Los Alamos National Laboratory and Physicist, Lawrence Berkeley Laboratory. Instructor to Associate Professor of Physics, Professor of Physics, and Emeritus Professor of Physics. Obtained PhD (Physics) in 1949. Experiencing the first nuclear explosion [sound recording] / 1968 December. High energy physics session [sound recording], 1964 April 30. Oral history interview with Owen Chamberlain, 1976 June 16, 21, August 4 and 13. How well we meant [videorecording], 1983. Oral history interview with Andrea Dupree, 2007 October 29. Oral history interview with Lincoln Wolfenstein, 1997 April 19. The world of Enrico Fermi [motion picture]. Polarized beams at SSC, Ann Arbor, MI, 1985 ; Polarized antiprotons, Bodega Bay, CA, 1985 / editors, A.D. Krisch & A.M.T. Lin, O. Chamberlain. The Discovery of the Antiproton, in Pions to Quarks: Particle Physics in the 1950s, ed. Laurie M. Brown, Max Dresden, and Lillian Hoddeson (Cambridge, UK: Cambridge University Press: 1989), 273-284. Owen Chamberlain Physics Today obituary. Owen Chamberlain: 1920-2006, Biographical Memoirs of the National Academy of Sciences.